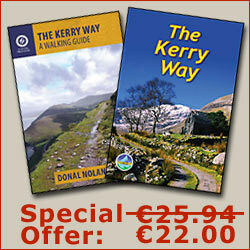 Map 84 is on a scale of 1:50,000 and covers approximately 100km of the centre section of the Kerry Way. 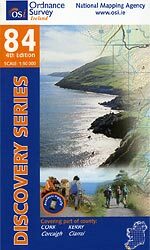 The 4th edition of this map was released in 2010 at the same time as Maps 78 and 83. The Kerry Way appears on Map 84 from just north of Waterville as far as Templenoe (10km west of Kenmare). A large section of this map overlaps Map 83 with the only additional section being the 20km stretch from Sneem to Templenoe. 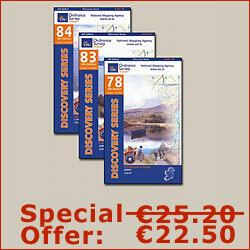 Other popular attractions that appear on Map 84 are Lough Currane, Derrynane National Park and Scariff Island. In addition to the Iveragh Peninsula, the map also includes most of the more southerly Beara Peninsula. There is another fine walking trail here called the 'Beara Way' which skirts around the Caha Mountain range.